Silsden hosts major championship egg show Craven Poultry Keepers Club staged its 'Guineas' Championship Egg Show at Silsden Town Hall on Sunday, June 10th. The new venue was judged to be a big success, attracting some 400 entries. The 'best in show' winner received 100 guineas and the reserved 'best in show' 50 guineas. Judge Roz Boothman, of Silsden, cracks a goose egg in the 'waterfowl contents' class. The show, held under Poultry Club of Great Britain rules, is usually held at Skipton Town Hall but was unavailable due to refurbishments. Edward Dickinson shows three eggs produced by his Black Oakworth hens. Edward has developed the breed over the last 10 years in a quest to produce a hen that lays dark brown eggs more prolifically than the traditional types. Geoff Lockwood, from Huddersfield, was last year's Guineas winner for the third time. Goose eggs have brought him all three triumphs. Judge Colin Clark studies entries in the class for three large light brown eggs. Judge Leon Smith weighs a contender in the class for three bantam distinct colours. Karen Millard (left), Roz Boothman and Craven Poultry Keepers Club secretary Jayne Gillam ponder entries in the classes for painted and decorated eggs. Karen also judged the photographic classes. Her partner's firm, Chris Wright Haulage, sponsored the 'best in show' award. Craven Poultry Keepers Club chairman Edward Boothman, of Howden Park, Silsden, is a former chairman of the Poultry Club of Great Britain. One of the UK's leading suppliers of pullets, he has been renowned in the poultry world for many years. The Marans breed, famous for laying richly dark brown eggs, is particularly associated with Silsden, which for generations was noted nationally for its poultry breeding and expertise. Silsden farmer Maurice Jackson, who died in 2016, was presented with a Lifetime Achievement Award by the Marans Club of Great Britain for 77 years devotion to the breed, which his uncles were credited with introducing to this area. Mrs Ruth Jackson, Maurice's widow, is president of the Craven Poultry Keepers Club. 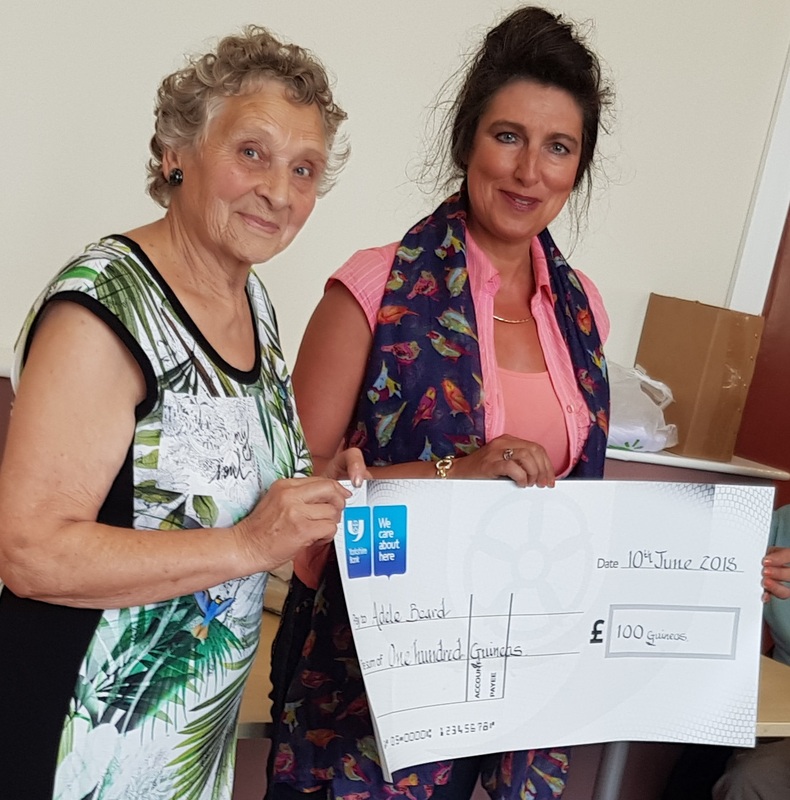 Craven Poultry Keepers Club president Ruth Jackson (left) presents the cheque for 100 guineas to Adele Beard, from Ossett, who won the Best in Show and Poultry Club of Great Britain gold award with three distinct colour bantam eggs. Adele also won the Reserve Best in Show (50 guineas) and PCGB silver award for three goose eggs. Nobody has done the double before. Photograph by Jayne Gillam.